Hotel pickups start at 7:30 am from centrally-located hotels. The guide's explanations are bilingual: English&Spanish and German&French. You will hear only your language through the headset. Visit Tivoli, an ancient resort area famed for its beauty and its good water, enriched by many Roman villas, the most famous one, of which the ruins remain, is Villa Adriana. 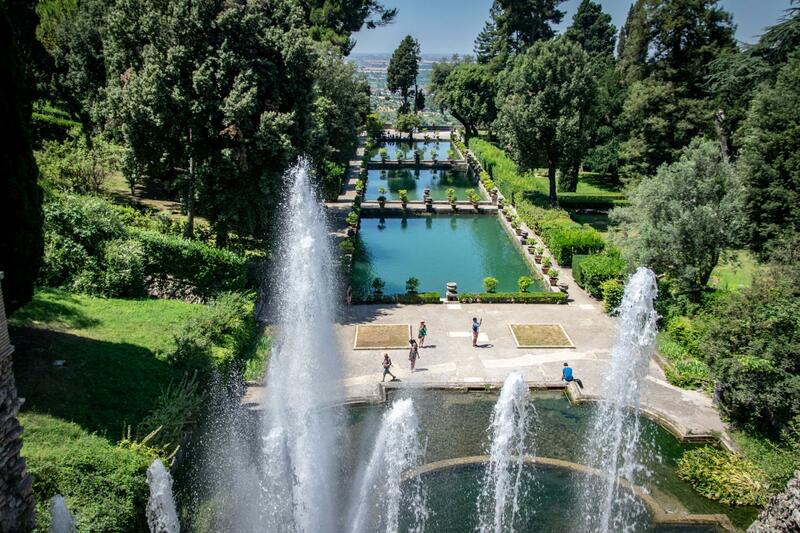 Take a comfortable transport to the little town of Tivoli, located a few kilometers from Rome, in a splendid natural environment between the Eternal City and the high hills to the east of Rome. Since ancient times this little town has been blessed by a great climate and always had a key importance due to its location. The most remarkable architectural complex is Villa Adriana, dating from the Ancient Roman time, created in the 2nd century AD by the Emperor Hadrian. It combines different architectural styles from Egypt, Rome and Athens, in the shape of an "ideal city". For this reason a visit to the Villa cannot be missed: it is a masterpiece that uniquely brings together the highest symbols of cultures of the world in ancient times. The Villa covers more than 120 hectares and was the House of the Emperors for more than 50 years. After this amazing visit, come to discover the Renaissance-style Villa d’Este, a gorgeous palatial setting surrounded by a spectacular terraced garden. Enjoy the beauty of its cascades, water tanks, and fountains. Villa d'Este is a masterpiece of the Italian Gardens, decorated with a massive and impressive number of fountain nymphs, grottos and marvelous courtyards inspired by the gardens of Babylon, one of the wonders of ancient world. Strongly desired by the Cardinal Ippolito II d'Este, the Villa was enlarged and enriched by all his descendants with the contribution of incredible artists of the times, like Gianlorenzo Bernini. Return to Rome in the afternoon. Great excursion!! The day in Tivoli was just perfect after a couple days in Rome. We were among the first to arrive at Hadrian's Villa so no crowds and so very interesting. We then moved on to Villa d'Este and what an amazingly beautiful place!!! We highly recommend this tour, the short drive there was relaxing, the itinerary was perfect and our tour guide was wonderful. We are glad to hear that you enjoyed Tivoli! Our tour guides are the best in the business and we love to hear that they were able to help make your experience a memorable one. We would love to see you again sometime soon! Well organized, good guides and a great place to see.I like having headsets to hear the guides. Makes it a very enjoyable tour.